Crescent Hill diamond in the rough. 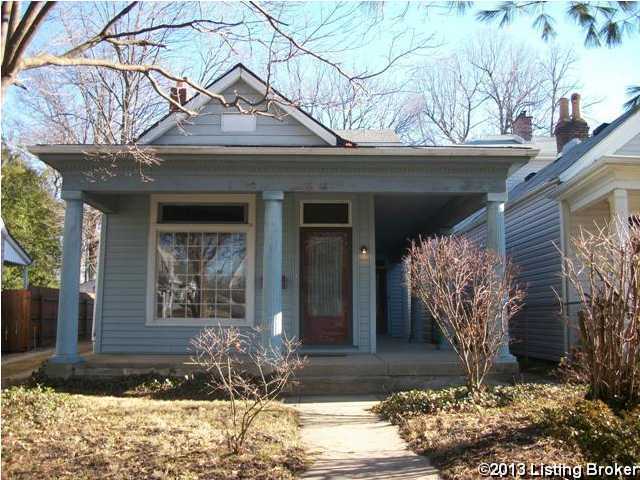 Great location near the library and Frankfort Avenue boutiques and restaurants. Good space, hardwood floors, tall ceilings and original character are still there. You will love the wrap around porch - perfect for enjoying the action on The Avenue! There is a driveway off N. Birchwood as well as alley access. The home backs up to the St. Joseph property. Home is offered ''as-is''. Great opportunity! Crescent Hill is a subdivision within the city of Louisville, Kentucky. There are currently 8 Homes for Sale within Crescent Hill, with asking prices ranging from $219,900 to $449,900. The average list price per square foot of the available inventory in Crescent Hill is $167, which is above the Louisville average of $155. The Average Sales price of all sold real estate in this subdivision for the past year is $332,796. Recent comparable homes have been selling for 97.84% of their asking price. Waterfront homes represent 75.00% of the available Crescent Hill inventory. The population of Louisville, according to the 2010 Census, is 597,337. The total number of households in the zip code of Crescent Hill is 9,488, with an average household size for of 1.92 people. The total number of renter households within the zip code of 40206 is 4,448, which means that 53.12% of households in this zipcode are owner occupant households. 103 N Birchwood Ave, Louisville KY 40206 is a Home, with 3 bedrooms which is recently sold, it has 1,766 sqft, 0 sized lot, and 2 Car Carport parking. A comparable Home, has 3 bedrooms and 2.5 baths, it was built in and is located at 200 N Birchwood Ave Louisville KY 40206 and for sale by its owner at $ 389,000. This home is located in the city of Louisville , in zip code 40206, this Jefferson County Home, it is in the CRESCENT HILL Subdivision, and CLIFTON are nearby neighborhoods.